MANLEY –FLORENCE M. GREENE, 65, of Troy RD 2, died Friday, May 20, 1983, at the Troy Community Hospital. Mrs. Greene was born Oct. 21, 1917, in LeRoy Township, a daughter of Ray and Daisy Lewis Manley. She was a member of the LeRoy Church of Christ. Surviving are her husband, Benjamin, to whom she was married 46 years March 20, 1983; two daughters, Mrs. Alan (Lorna) Craley of Elmira and Mrs. Jack (Barbara) Simcoe of Troy; sister, Mrs. C. K. (Aileen) Hoagland of Canton; four grandchildren, Alan Craley of the U.S. Navy in Norfolk, VA, Tracey Lynn Craley of Elmira, Robin Kay and Eric Lee Simcoe, both of Troy; and several nieces, nephews and cousins. The funeral service was held Monday from the Morse and Kleese Funeral Home with the Rev. Terry Sacks, her pastor, and the Rev. Garry Zuber, pastor of the First Baptist Church of Troy, officiating. Interment was in the East Canton Cemetery. Memorial donations may be made to the LeRoy Church of Christ in Mrs. Greene’s memory. –Canton Independent Sentinel. JESSICA JEANNE ‘JESS’ MARSHALL, 16, Roaring Branch, PA, formerly of Montoursville, tragically died, August 24, 2003 the result of an automobile accident in Troy Township. Born on July 25, 1987, in Towanda, she was the daughter of Jason Marshall and Michelle Hawk. She was a very friendly and outgoing young woman who loved life and enjoyed spending time with friends. Jess was active in school activities and loved journalism. She was a member of the yearbook staff and student council. In earlier years her cheerleading squad was awarded first in state competition. Surviving are her parents, Michelle Haw, Trout Run and Jason Marshall and fiancee Darla Carpenter, both of Roaring Branch; a brother and sister, Jeremy Marshall and Tiffany Rockwell, Roaring Branch; maternal grandparents, Richard and Carolle Bender, Trout Run; paternal grandparents, Jim and Sharon Marshall, Wyalusing; aunts and uncles; Terry Poeppling, Maryland; Jack (Renee) Marshall, Ohio; Jim Marshall, South Carolina; Jennie (Bill) Adkins, New York; Mark (Lynn) Hawk, Liberty; Joy (Scott) Beers, North Carolina; Star (Bob) Blend, South Carolina; Donna Westbrook, Wilkes-Barre; Debbie Moshier, Middleburg; many cousins and friends. Jessica’s very special friend, Brent Jennings, also died in the accident. The families of Jessica and Brent invite friends to call from 5 to 8 p.m. Thursday, August 28th at the Pepper Funeral Home, Springbrook Drive, Canton. The funeral service for Jessica will be held at 11 a.m. Friday, August 29th at the funeral home. Burial will follow in East Canton Cemetery. –Canton Independent Sentinel. GERALD S. ‘JERRY’ MAY, a Canton RR 2 resident, died in the early morning hours of Saturday, April 14, 2001, at home while surrounded by his loving family. Jerry was born in Canton on April 10, 1930, a son of the late Stanley Eugene and Beatrice Little May. As a young man he grew up in the Canton area and graduated from Canton High School, class of 1948. In earlier years, Mr. May proudly served as a medic in the National Guard for many years. Jerry a skillful mechanic and was employed by Calkins Motor Sales in Troy for 26 years until his retirement in 1995. Jerry was a life member of the Canton Fired Department; for many years he donated his time helping with the firemen’s fair and serving as a bingo caller. He was a former member of the First Baptist Church in Canton. Jerry loved playing bingo and working on word puzzles. He loved the outdoors; especially fishing, golfing, camping and attending local festivals and jamborees throughout the area. He also enjoyed salmon fishing trips to New York state. Surviving are: his wife of 15 years, Alice, at home; three daughters and a son-in-law, Linda Bedford of Horseheads, N.Y., Carol and Tim C. Castle of Canton, and Brenda Tillotson of Newburg, Md. ; seven grandchildren, Dustin Bedford, Chad, Scott and Stephanie Castle, Kristine Tillotson, and Sam and Max Kuhnel; a sister and brother-in-law, Linda and Paul Krise of Canton; his mother-in-law, Wilma Morgan of Canton; his father-in-law, Dean Morgan of Canton; a sister-in-law, Jane May of Ruskin, Fla.; three brothers-in-law and spouses, Herb and Sherry Morgan, Doyl and Marilyn Morgan, and Walter and Susie Morgan, all of Canton; several nieces, nephews and cousins. Mr. May was predeceased by a sister, Ruth May Peters, and a brother, Arthur Eugene May. The family invites friends to call from 7 to 9 p.m. Monday, April 16, at the Pepper funeral Home, Springbrook Drive, Canton. The funeral service will be held at 11 a.m. Tuesday at the funeral home, with Pastor Nancy Goff officiating, Interment will be held in the East Canton Cemetery. The family suggests that those who wish to may direct memorials to the Guthrie Hospice, RR 1, Box 154, Towanda, Pa. in Mr. May’s memory. –Towanda Daily Review. MAX E. ‘JUNIE’ MAY, 74, well-known resident of Canton, died while surrounded by his loving family Friday morning, November 20, 1998, at Robert Packer Hospital in Sayre following a brief illness. Max was born July 29, 1924 in Elmira, a son of the late A. Earl and Ethel Bailey May. He attended Troy schools. On January 21, 1956, he married the former Mila Adams in the Wysox Presbyterian Church, together sharing 41 years of loving marriage. Max was employed by the former Schrader-Bellows factory in Canton for 28 years, until his retirement in 1986. He then worked at the Towanda Country Club in Maintenance for five years. Max was a devoted member and past governor of the Loyal Order of Moose, Canton Lodge #429 and served as the Moose Lodge’s manager for several years. He also was a member of the Moose Legion No. 89, the Sons of the American Legion, Troy; and the Wheel Inn Club, Roaring Branch. Max enjoyed life and loved to golf. He possessed many friends throughout the area and will be dearly missed. Max held a special place in his heart for his family, especially the love he shared with his four grandchildren. Surviving are his wife, Mila, at home; two sons and daughters-in-law, Kevin and Sheila May, Canton; Randy and Deanna May, Canton; four grandchildren, Danielle May and her fiancée, Chad Deitrick; Melissa, Ryan and Becky May, all of Canton; two brothers, Galen and Virginia May, and Walter and Wilma May, all of Troy; sister and brother-in-law, Patty and Dale Hartford, Alba; sister-in-law Irene DeWolf, Mehoopany; several special nieces, nephews, and cousins. Max was preceded in death by a sister, Eloise VanNoy, June 24, 1997. The Canton Loyal Order of Moose conducted a memorial ceremony at the Pepper Funeral Home, Springbrook Drive, Canton, at 7 p.m. on November 23. The funeral and committal service followed immediately with rev. Jasper Smith, retired Methodist minister, officiating. Interment will be held in the East Canton Cemetery at the convenience of the family. The family suggests that in lieu of flowers, memorials may be directed to the Canton Moose Lodge Building Fund, PO Box 161, Canton, PA in the loving memory of Max E. May. –Canton Independent Sentinel. STANLEY E. MAY, age 76, of 146 E. Main St., Canton, died at Memorial Hospital, Towanda, Saturday evening, March 11, 1978. He was born in Sullivan County July 25, 1901, a son of Frank and Carrie Webster May. Mr. May was a postal dispatcher in the Canton Post Office of 42 years, retiring in 1968. Surviving are a daughter, Mrs. Paul Krise of Canton RD 1; two sons, Arthur E. May of Canton RD 1 and Jerry S. May of Canton; five grandchildren; two great-grandchildren; several nieces and nephews. The funeral was held Tuesday at 2:00 p.m. from the Morse Funeral Home, Canton, with the Rev. Melvin Shultz, pastor of the LeRoy Baptist Church, officiating. Interment was in the East Canton Cemetery. –Canton Independent Sentinel. DR. ORLO G. McCOY Of Canton Dies In His Home Friday. Orlo G. McCoy, M.D., 73, 137 N. Center St., Canton, Pa., died Friday, March 20, 1987 at his home. He was born April 7, 1913, in Smethport (McKean County) son of Guy H. and Edna A. Dunbar McCoy. He attended the Smethport Public Schools, and graduated cumlaud from Peddie School in Hightstown, N.J. He received his pre-med education at the University of Rochester, N.Y. and the University of Pittsburgh. He received his medical degree in 1940 from the University of Pittsburgh School of Medicine. After serving one year of rotating internship at the Robert Packer Hospital from 1940-41, he entered into general practice in Corry (Erie County) from 1941-42. Dr. McCoy served in the medical corps of the U.S. Army from 1942-45. During this time, he was a captain in ETO under General Patton. He served in the 317th Infantry; 80th Division; 32nd Evacuation Hospital; and 253rd Armored Field Artillery Battalion. He received battle stars for the following campaigns; Normandy, France, Belgium, Battle of the Bulge, Germany and Czechoslavakia. In Sept. 1945, he entered a three-year residency program at the Guthrie Clinic, Robert Packer Hospital in internal medicine under Dr. Conklin. Dr. McCoy opened his practice in Canton on Nov. 16, 1946, for the life work of general practice of medicine. He continued this practice until his death. His principal interest, in order of importance, were his family, his professional practice and taking part in the activities of “organized medicine.” Other compelling interests through the years have been church activities, singing, reading, hunting, fishing and camping. He had also worked in voluntary health organizations (tuberculosis, cancer, and heart, to name a few) and had exceeded the four-gallon level as a blood donor. An author of many scientific articles, he had been president of the Bradford County Medical Society in 1948, and had served as delegate from Bradford County to the Medical Society’s House of Delegates for 25 years. Since 1970, he has been a trustee and councilor (12 district) for the Pennsylvania Medical Society. His district includes Bradford, Sullivan, Wyoming, Susquehanna and Luzerne counties. Other state society assignments included chairmanship of the Quackery Committee, and membership on the Officers Conference Committee and the Publication Committee of “Pennsylvania Medicine.” He was also a member of the Bradford County Medical Society, Pennsylvania Medical Society, American Medical Association, Canton Ecumenical Parish, the Canton Lodge F&AM 415, Coudersport Scottish Rite Bodies AASR, Canton VFW Post 714, Williamsport APOE Elks, and former member of the Canton Rotary Club. He was also the school physician for the Canton Area School District for 25 years. He had also been the recipient of the Citizen of the Year Award presented by the Canton Rotary and Lions clubs. Survivors include his wife, Loreen Hughes McCoy, whom he married on Feb. 25, 1970; four daughters; Mrs. w. F. (Judy) Coole, Mansfield; Mrs. Allen (Susan) Stull and Dr. Kathryn C. McCoy, both of Canton; Ms. Enola McCoy, Dallas, Pa.; son, James E. McCoy, Tamarac, Florida; five step-children: Mrs. Mark (Rogeen) Goodreau, Tioga; John R. Halleran, Jr., Aruba; Mrs. James (Zip) Slaybaugh, Dallas, PA; Mrs. John (Karen) Detweiler, Mansfield; Richard I. Halleran, Newmanstown; 17 grandchildren; sister-in-law, Mrs. Vivian McCoy, Port Allegany, Pa.; brother-in-law, Rev. Richard L. Hughes, Jr., Columbus, Ohio; mothers-in-law; Mrs. Dorotha Hughes, Tioga; and Mrs. Mary Cronshey, Canton. He was predeceased by his wife the former A. Lucille Cronshey in 1969, and two brothers and one sister. Funeral services will be held Monday at 11 a.m. at the Canton Ecumenical Parish, Center St., Canton with Rev. Richard Barner, his pastor, and an Episcopal minister officiating. Interment will be in the East Canton Cemetery. VFW Post 714 will accord military honors. Friends may call at the Morse-Kleese Funeral Home, 40 N. Center St., Canton, Sunday 2-5 p.m. The F&AM Lodge 415 will conduct memorial services Sunday at 4:30 p.m. at the funeral home. Memorial donations may be directed to the Education and Scientific Trust of the Pennsylvania Medical Society, 20 Erford Rd., Lemoyne, PA or the Canton Green Free Library, Canton. –Canton Independent Sentinel. LEVI HENRY McNEAL, infant son of Richard G. McNeal Jr. and Sharlett Monro McNeal of Troy, died Monday afternoon, Dec. 20, 2004, at the Arnot Ogden Medical Center in Elmira, N.Y. Levi was born dec. 17, 2004, at the Arnot Ogden Medical Center in Elmira. In addition to his parents he is survived by: two brothers, Richie McNeal III of Luthers Mills and Jay Anderson of Troy; a sister, Dana Anderson of Troy; his maternal grandparents, Gary and Alexis Monro of Troy; his paternal grandparents, Richard and Leona McNeal Sr. of Luthers Mills; maternal great-grandparents Theron Binford Sr. of Troy and Catherine Monro of Troy; paternal great-grandmother Beatrice Smith of Luthers Mills; and several aunts, uncles and cousins. A private graveside service will be held at the East Canton Cemetery, east Canton, with Mr. Charles Binford officiating. Arrangements are under the direction of the Maryott-Bowen Funeral Home, Towanda. –Towanda Daily Review. McNEIL - CANTON – Mrs. L. Virginia Castle, 75 of Canton RD 1, died Sunday, Dec. 8, 1974 in the Williamsport Hospital.She was born on July 17, 1899, in Virgil, NC, a daughter of Bynun and Rachel Wagner McNeil. Surviving are three daughters, Mrs. Albert Duda, of Edison, NJ, Mrs. Jack Huffman, of Canton RD 1, and Mrs. Gordon Schanbacher of Liberty; a son, Charles E. of Canton RD 1; three brothers Joseph McNeil, of Vilas, NC, and Grady and James McNeil of Boone, NC, three sisters, Mrs. __erta Jackson, of Stevensville, Mont., Mrs Martha Castle, of Canton, and Mrs Ann Teague, of Boone, 10 grandchildren and two great-grandchildren.Burial will be in East Canton Cemetery. McNEIL –MRS. L. VIRGINIA CASTLE, 75, Canton RD 1, died Sunday evening, Dec. 8, 1974, in the Williamsport Hospital following a lengthy illness. She have been admitted to the hospital on Nov. 13 as a medical patient. The widow of Benjamin H. Castle, she was born on July 17, 1899, in Virgil, N.C., daughter of Bynum and Rachel Wagner McNeil. She was a member of the Christian Women’s Fellowship of the East Canton United Methodist Church. Mrs. Castle was also a member of the Beech Flats Grange No. 336. Surviving are three daughters, Mrs. Albert (Alma) Duda of Edison, N.., Mrs. Jack (Jean) Huffman of Canton RD 1 and Mrs. Gordon (Dorothy) Schanbacher of Liberty; one son, Charles E. of Canton RD 1; ten grandchildren; two great-grandchildren; three brothers, Joseph of Vilas, N.C., Grady and James, both of Boone, N.C.; three sisters, Mrs. Berta Jackson of Stevensville, Mont., Mrs. Martha Castle of Canton and Mrs. Ann Teague of Boone, N.C.; a number of nieces, nephews and cousins. Funeral services will be held Wednesday at 1:30 p.m. at the Ralph T. Kleese Funeral Home, 40 N. Center St., Canton. Burial will be in the East Canton Cemetery. The Rev. Jasper Smith, a lay minister, and the Rev. Larry Clark, former pastor of the East Canton United Methodist Church will officiate. –Towanda Daily Review. McNEIL –MARTHA M. CASTLE, 83, West South Avenue, Canton, died Friday at the Robert Packer Hospital, Sayre. She was the widow of Robert S. Castle. Mrs. Castle was born Feb. 17, 1897, a daughter of Bynum and Rachel Wagner McNeil in Lexon, N.C. She was a member of the East Canton United Methodist Church for 38 years. Surviving are two sons, Robert of Liberty, Pa. and Joe of Canton; two daughters, Mrs. Willis (Marilyn) Gray of Canton and Mrs. Rod (Elizabeth) Krise of Cottonwood, Arizona; two brothers, James McNeil of Boone, N.C. and Joe McNeil of Vilas, N.C.; one sister, Mrs. Ann Teague of Boone, N.C.; nine grandchildren; four great-grandchildren; and several nieces and nephews. Funeral services will be held Sunday 2 p.m. at the Morse-Kleese funeral Home, 40 N. Center St., Canton with the Rev. Jasper Smith, pastor of the Ward Methodist Church officiating. Interment will be in East Canton Cemetery. Friends may call at the funeral home Saturday evening from 7 to 9 and from 1 to 2 p.m. Sunday afternoon. –Towanda Daily Review. H. IVAN MEEKER, 71, life-long resident of Canton, Pa., died on Wednesday, Jan. 18, 2006, at the Robert Packer Hospital, in Sayre. Ivan was born in Canton Township on Dec. 16, 1934, the third son of the late Horace T. and Mildred (Kendall) Meeker. Ivan was a 1952 graduate of Canton High School, where he enjoyed playing basketball. On July 27, 1958, he married the former Joyce Smiley. They were blessed with 47 wonderful years together and raised two children. Ivan was employed with the Hilliard Corp. in Elmira, N.Y., for more tan 39 years as a sales representative, during which he traveled throughout the country. After retirement he became a licensed real estate agent with Coldwell Banker’s preferred properties in Towanda, Pa. During his 10 years of service, Ivan earned several top sales awards including the distinguished International Sterling Society Award and was chosen as “Realtor of the Year” for 2004. Mr. Meeker was an outgoing and friendly man who was very dedicated to his community. He was a well-known and respected fireman for more than 50 years. In 1955 Ivan joined The Innes Hose Company (Canton Borough Fire Department). That same year he was elected president (which continued until 1998). He was one of the founders of the annual Canton Firemen’s Fair, the Canton Firemen’s Banquet, and the fire hall’s bingo games and chicken barbeques. Ivan was an important part in the organization of the Central Northern Tier Fire Training Ground in Tioga County, Pa. He served as secretary to the Bradford County Firemen’s Association since 1964, organized instructors for the Bradford County Fire Schools from 1960, coordinated equipment used for Bradford County’s Firemen Convention parades and assisted on many various fire company committees. He was honored to serve as the 2000-2001 president of the Pennsylvania State Firemen’s Association and in 2004 was selected as its “Fireman of the Year.” Ivan was also active with the Firemen’s Legislative Federation of Pennsylvania and Canton Fire Police. He was a director, first aide and a driver of the Canton Ambulance Association from 1960 to 1994. Since 1972 he served on the Bradford County Housing Authority’s board of directors. Ivan was a brother Mason, and a past master and secretary. He also was a member of the Canton Moose Lodge No. 429 and the Wheel Inn Club. Surviving are his wife, Joyce, at home; two children, a daughter, Joan Dahl of Penfield, N.Y., and a son, Jared (Beth) Meeker of Greece, N.Y.; three grandchildren, Eric Dahl, Andrew Ivan and Danielle Meeker; four sisters-in-law and a brother-in-law, Hazel Meeker of Mansfield, Pa., Ella Meeker of Hughesville, Pa., Sandra Garrison of Troy, and Barbara and Philip Eiffert of Columbia Cross Roads; and many nieces, nephews, cousins, friends and neighbors. He was predeceased by his son-in-law, Larry Dahl, and two brothers, Eldon “Red” and Donald Meeker. Friends may call from 2 to 4 p.m. and 6 to 9 p.m. on Friday, Jan. 20, at Pepper Funeral Home in Canton. Additional visitation will be held from 10 a.m. to noon on Saturday at the Canton Church of Christ (Disciples of Christ), located at 40 N. Minnequa Ave., in Canton. The funeral service will follow at noon with the Rev. David B. Morris officiating and the chaplain of the Pennsylvania State Firemen’s Association, George Coleman, assisting. Burial will be in East Canton Cemetery. His family requests that in lieu of flowers those who wish may direct memorials in Ivan’s name to The Innes Hose Company at P.O. Box 72, Canton, Pa. The American Cancer Society, 1948 E. Third St., Williamsport, Pa. or to a church of one’s choice. –Towanda Daily Review. MEEKER H. Ivan Age 71, a lifelong resident of Canton, PA, died on Wednesday, January 18, 2006, at the Robert Packer Hospital in Sayre. Ivan was employed with the Hilliard Corp. in Elmira, NY for over 39 years as a sales representative in which he traveled throughout the country. After retirement he became a licensed real estate agent with Coldwell Banker's Preferred Property Co. in Towanda, PA. During his 10 years of service, Ivan earned several top sales awards, the Distinguished International Sterling Society Award and was chosen as "Realtor of the Year" for 2004. 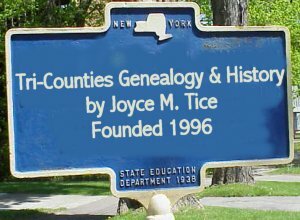 Surviving is his wife, Joyce, at home; two children, a daughter, Joan Dahl of Penfield, NY; a son, Jared (Beth) Meeker of Greece, NY; three grandchildren, Eric, Andrew Ivan, and Danielle. Friends may call Friday, January 20, from 2-4 p.m. and 6-9 p.m. at Pepper Funeral Home in Canton. Additional visitation will be held 10-noon on Saturday at the Canton Church of Christ (Disciples of Christ) located at 40 N. Minnequa Ave. in Canton. The funeral service will follow at 2 p.m. with Rev. David B. Morris officiating. Burial will be in East Canton Cemetery. His family requests that, in lieu of flowers, those who wish may direct memorials in Ivan's name to The Innes Hose Company at P.O. Box 72, Canton, PA 17724, The American Cancer Society, 1948 E. Third St., Williamsport, PA 17701, or to a church of one's choice. LESTER MERRICK, 81, of Troy RR 2 died Dec. 22, 1993, at home. He was born Oct. 30, 1912, in Masten, Lycoming County, a son of Hiram L. and Vernie B. Wilcox Merrick,. Lester was a coal miner for 27 years. In later years he worked as a mechanic before retiring in 1979. He was a member of the Canton Loyal Order of Moose No. 429 and the Theodore Roosevelt American Legion Post No. 167, Morris Run. Surviving are two sons and daughters-in-law; Donald and Ruth Merrick, Ransomville, N.Y., and William and Linda Merrick, Covington; 10 grandchildren; nine great-grandchildren; three sisters; Mrs. Ruth Ross, Bath, N.Y., Mrs. Marian Williams, Mansfield RR and Edith Hatherill, Middlebury Center; four sisters-in-law; Mrs. Anna Merrick, Augusta, Ga., Mrs. Marcelle Merrick, Canton, Mrs. Constance Merrick, Troy, and Mrs. Norma Merrick Wysox; and nieces and nephews. Lester was predeceased by his wife of 52 years, Halilah, in 1984; five brothers, Luther, Leon, Harold, Charlie and Carlyle (Pete); and two sisters: Ellen Heater and Minnie Hurlburt. Visitation will be Friday, Dec. 24, 1993, from 1 to 2 p.m. at the Morse and Kleese Funeral Home, 40 N. Center St., Canton. The funeral service will be held at 2 p.m. at the funeral home with the rev. Jasper Smith, retired Methodist minister, officiating. Interment will be in East Canton Cemetery. –Towanda Daily Review. MERRIMAN - Barbara Merriman Palmer During the early morning hours of Saturday, July 25, 2009, former Canton resident Barbara (Merriman) Palmer, 88, died quietly at the Presbyterian Home of Central New York, located in New Hartford, where she and her husband resided recently. Born Aug. 21, 1920, in Belmont, N.Y., she was the daughter of Kenneth and Helen (BURNS) Merriman. Barbara attended Cornell University, graduating with a Bachelor of Science degree in home economics, and was employed for a while as a dietitian at Wyoming County Community Hospital in Warsaw, N.Y. She was married to Dr. Hallsey R. Palmer, D.V.M. Together they raised two daughters and a son and shared 66 years. The Palmers spent most of those years in Canton, Pa., where they made many lifelong friends and immersed themselves in the betterment of the community. Mrs. Palmer was a member of the Village Improvement Association, volunteered for many years at the Canton Food Pantry, and was a founder of the Canton Community Clothing Center. She also was active in the Canton Literary Club, the Minnequa Grange 754, and the Chi Omega Sorority. She enjoyed quilting and playing cards, especially bridge and poker, which she and her husband shared for 50 years on a regular basis with their friends along East Union Street. Barbara was a woman who had a deep, abiding faith in the Lord, and was an active member of the Church of Christ (Disciples) in Canton for many years. Mrs. Palmer is survived by: her husband Hallsey; daughters Diane (and Robert) Grubb of Craig, Colo., and Donna (and Peter) Goodfriend of Clinton, N.Y.; son Douglas (and Marsha) Palmer of Williamsport, Pa.; grandchildren Stephanie Spencer Herod and Christopher Spencer of Craig, Colo., David Goodfriend of Clinton, Kristen Goodfriend and Carrie Goodfriend of Boston, Amy (and Michael) Giordano of St. Augustine, Fla., and Ann Palmer of Williamsport; and 11 great-grandchildren. She was preceded in death by her brother, Dudley Merriman, and infant twin daughters, Nancy and Patricia. In accordance with Mrs. Palmer's wishes, all services will be private and have been entrusted to Morse and Kleese Funeral Home, Canton. 27 July 2009, Towanda Daily Review. DONALD O. MERRITT, 78, of Gillett RD 1, died at St. Joseph’s Hospital, Elmira, early Thursday, Dec. 25, 1975, after a long illness. He was born in Swarthmore, Pa., on Aug. 18, 1897, the son of James U. and Jennie Landon Merritt. Mr. Merritt retired in 1958 from the former Remington- Rand Corporation in Elmira. He was a member of the Canton Church of Christ, Disciples and a 30-year member of the Canton Moose Lodge No. 429. He was also a member of the Williamsport Eagles No. 173 and a member of the Elmira Elks. Mr. Merritt was a life member of the Innes Hose Company of Canton. He is survived by three daughters, Mrs. Lemuel (Virginia) Shadduck of Canton, Mrs. Frank (Joann) Brewer of Gillett RD 1, with whom Mr. Merritt lived, and Mrs. Frank (Audrey) Morgan of Clintonville, Wis., one son, Max Merritt of Cohocton, N.Y., 14 grandchildren; seven great-grandchildren; several nieces and nephews. Funeral and committal services will be held at the Ralph T. Kleese Funeral Home, 40 N. Center St., Canton, on Sunday at 2 p.m. with Pastor Donald D. Rockwell of the Fassett Baptist Church officiating. Burial will be in the East Canton Cemetery. –Canton Independent Sentinel. MERRITT –JOANN M. BREWER, 53, of Lake Jackson, Texas, formerly of Gillett, died March 2, 1984 at the Houston Diagnostic Center, Houston, Texas. She was born January 30, 1931 in Canton, the daughter of Donald and Luella McCraney Merritt. Survivors include her husband Frank; three sons, Donald Earle of Elmira, N.Y.; Terry Brewer and Mark Brewer of Lake Jackson, Texas; two daughters, Mrs. Albert (Susan) Craig of West Columbia, Texas and Mrs. Doyle (Mary) Mitchell of Sweeney, Texas; two grandchildren; two sisters, Mrs. Lemuel (Virginia) Shadduck of Canton and Mrs. Frank (Audrey) Morgan of Clintonville, Wisconsin; one aunt, one uncle and several nieces and nephews. Funeral services will be held Wednesday at 1 p.m. at the Morse & Kleese Funeral Home, 40 N. Center St., Canton with the Rev. Donald Rockwell officiating. Interment will be in East Canton Cemetery. Friends may call at the funeral home from 7 to 9 p.m. at the funeral home. –Canton Independent Sentinel. MAX M. MERRITT, 56, of Cohocton, N.Y., a Canton native, died Thursday, Oct. 13, 1977, in Davenport Hospital, Bath, N.Y., of Injuries suffered earlier that day in a traffic accident at Kanona, N.Y. He was born May 14, 1921 a son of Mr. and Mrs. Donald Merritt. Mr. Merritt was a retired welder. He was a member of the Canton Church of Christ. He was a Navy veteran of World War II. Surviving are three daughters, Mrs. Davis Shedden and Miss Deborah Merritt, both of Canton, and Mrs. Linda Duncan, of Virginia Beach, Va.; three sisters, Mrs. Lemuel Shadduck of Canton, Mrs. Frank Brewer, of Lake Jackson, Tex., and Mrs. Frank Morgan of Clintonville, Wis. and two grandsons. The funeral will be at 2 p.m. Tuesday at Morse’s, 12 East Main Street. Burial will be in East Canton Cemetery. The Rev. Donald Rockwell will officiate. Friends may call at the funeral home from 7 to 9 p.m. Monday. –Canton Independent Sentinel. MERRITT Virginia - On the afternoon of Wednesday, Aug. 26, 2009, Canton resident Virginia Elnora (Merritt) Shadduck died quietly at Bradford County Manor. She was 86 years of age. Born in Canton on Sept. 5, 1922, she was the daughter of Donald Osborn Merritt and Florence Luella (MCCRANEY) MERRITT. Virginia was a graduate of Canton High School and was married to Lemuel B. Shadduck. In addition to being a homemaker and mother, she worked for many years at the former Preston's Store in Canton. Virginia enjoyed playing cards with her friends in Canton. She also enjoyed square dancing, knitting and crocheting. She enjoyed traveling throughout the country by Winnebago, especially to Florida. She enjoyed the company of her family and friends and enjoyed entertaining them with her player piano. Virginia was a woman of faith and shared in the Christian fellowship of the Church of Christ in Canton. Surviving are her daughters, Bonnie (Larry) Pollow of Horseheads, N.Y. and Kathie (Gary) Goodwin of East Smithfield; her grandchildren, Amy Kennedy of Sayre, Kelly (Joe) Gasienski of Horseheads, Jay (Heather) Kennedy of East Smithfield, Christopher (Debbie) Porter of Clermont, Fla., Cory Goodwin (fiance Angela Daniels) of East Smithfield; her great-grandchildren, Mitchell, Mackenzie and Zane Vargason, Jordan, Searah and Kolan Kennedy, Brianna and Tyler Porter; nieces, Maxine (Davis) Shedden, Linda Merritt, Debbie (Tom) Elliott, Debbie (Bruce) Webster, Kim (Michael) Hollman, Sue (Al) Craig, Mary (Doyle) Mitchell; nephews, Donald (Michelle) Earle, Terry (Lori) Brewer, Mark Brewer, Trent (Laure) Morgan, Tim Morgan, Kevin (Marlene) Snell and Suzette (Richard) Lysack; sister-in-law Irma Earley and brother-in-law Frank Morgan and many cousins. She was preceded in death by her husband, Lemuel; brother, Max Merritt; sisters, Joann Brewer and Audrey Morgan; sister-in-law Bernice Spencer; and brother-in-law Frank Brewer. Visitation will be from 11 a.m. to 12:30 p.m. on Saturday, Aug. 29, at Morse and Kleese Funeral Home, Inc., 40 N. Center St., Canton. Service will follow at 12:30 p.m. with her pastor, Bonnie Browning, officiating. Internment will follow in East Canton Cemetery. The family suggests that memorial contributions be directed to the charity of one's choice. They also wish to thank the staff at Bradford County Manor for the excellent care and loving kindness given to Virginia these last two years. 28 August 2009, Towanda Daily Review. MILLARD –EVELYN M. MORGAN, aged 43, of Canton RD 1, died Saturday evening, March 9, 1974, at the Robert Packer Hospital in Sayre following an illness of two years duration. She was the wife of Dale Morgan. Mrs. Morgan was born May 30, 1930, in Lawton, Pa., the daughter of Walter and Dora Birchard Millard. For some time prior to her illness, she was employed by the Woven Label Co. of troy. She was a member of the Christian and Missionary Alliance Church at Canton and of the Mothers Athletic Club at Canton. In addition to her husband, she is survived by three sons, 2nd Lieut., Dale Morgan Jr., stationed in Germany; Thomas Morgan of Syracuse and Karl Morgan at home; a sister, Mrs. Richard Buckley of Marathon, N.Y.; six brothers, Lawrence Millard of Canandaigua, N.Y., Clifford Millard of Waverly, N.Y., Kenneth Millard of Rochester, N.Y., Ronald Millard of Montgomery, Ala., and Walter Millard of Downington, Pa. Funeral services will be held Tuesday afternoon at 2 o’clock at the Morse Funeral Home in Canton. The Rev. Douglas Ord, her pastor, will officiate and burial will be in the East Canton Cemetery. –Canton Independent Sentinel. Brian L. MOODY, 25, of Blairsville, PA, formerly of Troy, PA, died Saturday, July 3, 1999 as a result of an accidental drowning in Lakewood, NJ. Born April 30, 1974 in Williamsport, PA, he was the son of David Moody and Julia Warner. Brian grew up in the Canton area and attended Canton Elementary until graduating from sixth grade. In 1992 Brian graduated from Troy High School where he lettered in track. In 1997 he received a diploma in auto technology and body repair from the Remington School Vale Campus located in Blairsville, PA, graduating with a director’s award for a 4.0 GPA. Brian was employed by Dave’s Body Shop and Advance Auto Parts Store, both located in Indiana, PA. He was a member of Bakerburg Community Church in Mainesburg. In earlier years he belonged to the Leroy Baptist Church Awana’s Club. In his youth he also was a member of canton and Columbia Cross Roads Boy Scouts troops, belonging to the Order of the Arrow. He is survived by his mother, Julia Warner, Troy RR 1; his father, David Moody of Royersford, PA; brother LaRue Moody of Harleysville, PA; a nephew, Andrew Moody; several aunts, uncles and cousins. Funeral services were held July 10 at the Bakerburg Community Church with the Rev. William Pepper officiating with the Rev. Charles Park assisting. Interment was in the East Canton cemetery. Arrangements were by the Pepper Funeral Home in Canton. Memorials may be directed to the Child Evangelism Fellowship of Tioga County, 16 Charleston St., Wellsboro, PA 16901 or the charity of one’s choice. JACK L. MOORE JR., 23, of RR 1, Box 334, Canton, died Saturday, July 2, 1994, in east Canton as a result of fatal injuries sustained in a motor vehicle accident. Jack was born Dec. 2, 1970, in Williamsport, Pa., the son of Jack L. and DiAnn Parrish Moore. He was a 1989 graduate of Canton High School. He played Little League baseball (1982-83) and also Midget and junior high football in Canton. After high school, Jack attended and graduated from WITIC (welding school) in Selinsgrove and was employed as a welder at Tempella Power in Williamsport. Surviving are his parents, Jack and DiAnn Moore of Canton RR 1; a daughter, Kifflyn Moore of Port Orange, Fla.; three sisters; Mrs. Becky Castle of Canton RR 1, Mrs. Angela Gochnauer of Canton RR 3 and Miss Stacy Moore of Canton RR 1, his paternal grandfather, Carlyle Moore of Canton RR 1; nieces, Stephanie and Jessica Castle and nephews Joshua and Adam Gochnauer; and several aunts, uncles and cousins. Visitation will be held at the Morse and Kleese Funeral Home, 40 N. Center St., Canton, Monday, July 4, 1974, from 7 to 9 p.m. The funeral service will be conducted at the funeral home on Tuesday at 1 p.m. with the Rev. Melvin Good, Mennonite minister, officiating. Interment will be in the East Canton Cemetery, Canton Township. Expressions of sympathy in Jack’s memory may be directed to a charity of one’s choice. –Towanda Daily Review. MORGAN –CLARA E. SAVACOOL, 100, formerly of Canton and a resident of Bradford County Manor since Jan. 24, 1992, died there on Feb. 26, 1992. Mrs. Savacool was born on Nov. 19, 1891, in Armenia Township, the daughter of Simion and Rebecca Jane McKeil Morgan. Surviving are one daughter, Dorotha Rockwell, Athens; two sons, Carlyle Savacool, Horseheads, and Edward Savacool, Lakewood, CA; four grandchildren; nine great-grandchildren; and six great-great-grandchildren. She was predeceased by her husband, Victor Savacool, in 1973, and two sons, Leslie Tunnicliff, in 1975, and Burdett Tunicliff, in 1988. The funeral service was held Feb. 29, from the Morse and Kleese Funeral Home, Canton, with the Rev. Norman Pierce, her pastor, officiating. Interment was in East Canton Cemetery. –Canton Independent Sentinel. DALE E. MORGAN, JR. A spokesman from the Mansfield barracks of the Pennsylvania State Police reported that Dale E. Morgan, Jr., 26, of Mansfield RD 3 was killed (July 15, 1976) in a one-vehicle accident which occurred at 6 a.m. Thursday near Mainesburg. State police reported that Morgan was the operator and only occupant of the car at the time of the fatal mishap. Police said Morgan was traveling west on Rout 6, about four miles east of Mainesburg, and lost control of his vehicle while trying to negotiate a sharp left curve. His car then struck a tree stump. The cause of death was reported to be a broken neck. The 1969 Oldsmobile being driven by Morgan was totally demolished in the accident, it was reported. Mr. Morgan was born May 29, 1950 in Williamsport, the son of Dale and Evelyn Millard Morgan, Sr. He was a 1968 graduate of Canton High School where he was a member of the National Honor Society and an outstanding athlete in wrestling, football and baseball, serving as co-captain of both the wrestling and football teams. He is also a graduate of the class of 1972 of the West Point Military Academy. While at West Point he was a member of both the wrestling and football teams, winning two gold medals in wrestling. Mr. Morgan was presently attending Mansfield State College and was currently a history teacher at Mansfield High School where he also served as assistant wrestling coach. He is survived by his wife, the former Linda Riggs; a son, Ryan Morgan, at home; father, Dale Morgan, Sr. of Canton; two brothers, Thomas of Syracuse and Carl of Canton; paternal grandfather, William Morgan; several nieces, nephews and cousins. Funeral and committal services will be held Saturday at 2 p.m. from the Morse Funeral Home, 12 E. Main St., Canton with the Rev. Duane Taylor, pastor of the Troy Church of Christ, officiating. Interment will be in the E. Canton Cemetery. KARL W. MORGAN, 45, Canton RR3, died May 3, 2003. Born June 30, 1957 in Sayre, he was a son of Dale E. Morgan Sr., and the late Evelyn Millard Morgan. Graduating with the Canton High School class of 1976, he excelled in Warrior football and baseball. Mr. Morgan raised veal for several years at his homestead on Hogback Road in Canton Township. He enjoyed nature, being outdoors and was an avid fisherman and hunter. He also enjoyed NASCAR Racing. In addition to his father and step-mother, Dale E. and Dorothy Morgan, Prattville, AL, he is survived by his children, Karl “Buddy” Morgan, Jr., Canton and Lacy Morgan, Towanda; granddaughter, Kylia; brother, Thomas and Jennifer Morgan, South Euclid, OH; two nephews, Jeffrey Morgan and Ryan Morgan, many aunts, uncles and cousins. He was predeceased by his mother Evelyn in 1974 and his brother Dale Jr., in 1973. The funeral and committal services were held May 7 at the Pepper Funeral Home, Canton with Rev. Jasper Smith, retired minister, officiating. Interment was in the East Canton Cemetery. Those who wish may direct memorials in Mr. Morgan’s name to a charity of one’s choice. –Canton Independent Sentinel. MORSE –BERTHA E. WILCOX, 69, Canton RD 1, died April 7, 1988 at Divine Providence Hospital, Williamsport. Mrs. Wilcox was born Sept. 9, 1918 at W. LeRoy, a daughter of Peter and Ruth Andrews Morse. Mrs. Wilcox and her husband, Frank Wilcox, celebrated 51 years of marriage, Feb. 27, 1987. Also surviving are: a daughter, Mrs. Dale (Joyce) Isaacs, W. LeRoy; three granddaughters, Mrs. David (Brenda) Jackson, Alba, Mrs. Ronald (Bonnie) Corey, Miss Cindy Isaacs, W. LeRoy; a grandson, Frank Isaacs, W. LeRoy; one great-grandson, David Jackson, Alba; three step-great-grandchildren; two sisters-in-law, Mrs. Esther Morse, Canton and Mrs. Eliza Baker, Bradford County Manor; nieces and nephews. She was predeceased by two brothers, tor Morse and Guy Morse; also a great-grandson, Darin Isaacs. A graveside service was held in the E. Canton Cemetery with the Rev. Jasper Smith, a retired Methodist minister, officiating. Those wishing may forward memorial donations to the Canton Ambulance Association in Mrs. Wilcox’s memory. Arrangements were under the direction of the Morse and Kleese Funeral Home. –Canton Independent Sentinel. CARLYLE ‘LINK’ MORSE, 80, of Canton RR 1 (Leroy Township), died early Monday morning, Feb. 24, 1997, at the Troy Community Hospital following a period of declining health. Link was born on March 15, 1916, in Granville Township (Bunyan Hill). He was a son of the late Burr and Minnie Shedden Morse. Link was a life-long resident of Leroy. On December 24, 1935, he married the former Hazel Hill. Together the Morses celebrated 61 years of marriage. Link was a dairy farmer for most of his life. He owned and operated his farm until the mid 1980’s, when he started hauling cattle for other local farmers. Link found great enjoyment in trucking, visiting with other farmers and trips to the cattle sales at the Troy and Athens stock yards. He was a member of the Leroy Open Hand Grange No. 153 and also served as a former Leroy Township supervisor. Surviving are: his wife, Hazel Morse at home; a daughter and son-in-law, Patricia and Richard Bailey of Leroy; two granddaughters, Pamela Collins of Bunyan Hill and Susan Scott of Leesburg, Fla.; two great-granddaughters, Stephanie and Stacey Scott; a brother, Harry Morse of Canton RR 1; four sisters, Ruth Wilcox, Martha Pepper, Marjorie Wright, all of Canton and Zelma Jennings of Canton RR1; several nieces, nephews and cousins also survive. In addition to his parents, he was preceded in death by a brother, Erwin B. Morse in 1959. The family will receive friends from 6 to 8 p.m., Wednesday, Feb. 26, 1997, at the Pepper Funeral Home, Springbrook Drive, Canton. The funeral service will be held at 1 p.m. Thursday, with the Rev. Larry Jennings, Jr., Mr. Morse’s great-nephew officiating. Interment will follow in the East Canton Cemetery. The family suggests that memorials may be directed to a charity of one’s choice in Mr. Morse’s memory. –Towanda Daily Review. MORSE Dale S. On Saturday, March 26th, 2005, Canton native Dale Stanley Morse died at Royal Oaks Nursing Home in Avon Park, Florida. He was 48 years of age. Born in Blossburg December 10th, 1956, he was the youngest son of Dean and Myra (Guthrie) Morse. He was a former employee of Masonite. Calling hours will be 10 to 11 a.m., Saturday, April 2nd, at the Morse & Kleese Funeral Home, Inc., 40 N. Center St., Canton. Service will be conducted at 11 a.m. Interment in East Canton Cemetery. DALE S. MORSE, on March 28, 2005, Canton native Dale Stanley Morse, 48, died at Royal Oaks Nursing home in Avon Park, Fl. Born in Blossburg, PA, on December 10, 1956, he was the youngest son of Dean and Myra Guthrie Morse. He was raised in Canton and attended Canton High School where he excelled in baseball and football. After graduating with the class of 1974 he attended Williamsport Area Community College (now Penn College) where he earned certification as an electrician. For many years he was employed at Masonite in Towanda. Later his electrical expertise secured him a position with the Kennedy Space Center at Cape Canaveral, FL. There he was assigned to the Delta launch pad, where he maintained the intricate electrical systems vital to the Space Program. Mr. Morse remained at the Cape for 10 years until his health would no longer permit him to work. In his spare time he was an avid golfer and motorcycle enthusiast, especially, Harley-Davidsons. He was a long-time member of ABATE of Florida. Surviving are his mother, Myra, (Guthrie) Morse, Avon Park, FL; brothers David L. (Ruth) Morse, Canton, Drake Morse (Wellsboro); daughters, Brandy Morse (and Mark) Hanson, Canton; DeAnna (and Steve) Williams; Deltona, FL; son, Dale Morse, North Carolina; grandchildren, Michaele Morse, Canton; Stephanie Williams, Deltona, FL; and Mackenzie Henson, Canton; and uncle, Donald Guthrie Media, PA; as well as several nieces, nephews and cousins. He was preceded in death by her father, Dean Morse, August 25, 1991. Calling hours will be 10 to 11 a.m. Saturday, April 2, at the Morse and Kleese Funeral home, Inc., 40 N. Center St., Canton. Services will be conducted at 11 a.m. with the Rev. Duane Taylor officiating. Interment will follow in the East Canton Cemetery. The family will provide flowers and suggest that memorial contributions may be directed to the Save the Poll c/o 40 N. Center St., Canton, Pa. –Canton Independent Sentinel. DEAN S. MORSE, 64, of 184 Fairway Drive, Avon Park, Fla., formerly of Canton, died Monday, Aug. 26, 1991, at home. Dean was born March 4, 1927, in LeRoy, the son of Stanley B. and Harriet Sims Morse. He was a 1945 graduate of Canton High School and a 1948 graduate of Pittsburgh Institute of Mortuary Science. He was a U.S. Navy Veteran of World War II. Dean was the former owner of the Morse Furniture Store and Morse Funeral Home in Canton until 1978 when he moved to Florida. He still assisted his son at Morse and Kleese Funeral Home in Canton. While residing in Canton he had bee a member of the former First Presbyterian Church and had served as trustee, elder and Sunday school superintendent. He had been active in numerous organizations including; Canton Rotary Club, past president; Towanda Elks; Corey Creek Golf Club, past president, board of directors; F&AM Lodge No. 415; First National Bank of Canton, board of directors; Wheel Inn Inc.; Scottish Rites Bodies and Valley of Williamsport; and Canton Borough Election Board. He had coached various baseball teams including Canton Little League and American Legion teams and was a former Cub Scout leader. He was a life member of V.F.W. Post No. 714, Canton, and a member of Tri-County Funeral Directors Association and the National Funeral Directors Association. Since moving to Florida in 1978, Dean had been employed as a funeral director for Kersey Funeral Home, Auburndale, and Ott-Laughlin Funeral Home, Winter Haven. Moving to Avon Park in 1982, he was presently employed with the Stephenson-Nelson funeral Homes in Sebring and Avon Park, Fla. He was a member of the Sebring Elks and River Greens Golf Club, Avon Park. He was a member and past president of River Greens Homeowners Association, Avon Park, Fla. Surviving are his wife of 43 years, Myra A. Guthrie Morse of Avon Park, Fla.; three sons and daughters-in-law; David L. and Ruth Morse, Canton, Drake G. and Cindy Morse, Mansfield, and Dale S. and Sherry Morse, Cocoa, Fla.; eight grandchildren; Brandy, Donna, Darrin, DeAnna, Dana, Nikolas, Kylie and Dale Morse; four aunts, one uncle and several cousins. The funeral service will be held Saturday, Aug. 31, 1991, at 11 a.m. at the Morse and Kleese Funeral Home 40 N. Center St., Canton, with the Rev. Jasper Smith, retired Methodist minister, officiating. Interment will be in Eats Canton Cemetery. Family and friends may call Friday from 6-8:30 p.m. The family will provide flowers. Memorial donations may be directed to LeRoy Community Association, in care of Mrs. Vicki Schrader, RD 1, Box 153, Canton, Pa. or a charity of one’s choice. –Canton Independent Sentinel. MORSE –Linda R. Lewis, Word has been received in the area of the death of Linda R. Lewis. Mrs. Lewis died September 30, 1990 in Riddle Memorial Hospital, Media, PA. She was born in Granville Township December 14, 1940 to Erwin and Beatrice Morse. She was a 1959 graduate of Towanda High School. Mrs. Lewis is survived by daughter, Bea Ann Sanford, Sharon, PA son and daughter-in-law, Jeff and Sherrie Bedford, Reynoldsville, OH; one granddaughter; mother and step-father, Beatrice and Dean Hall, Yuba City, CA; sisters, Beverly Schrader, LeRoy and Ella Morse, Yuba City, CA: twin brother, Richard Morse, Yuba City; special friend, Russ Schieble, Media; numerous aunts, uncles, nieces, nephews and cousins. She was predeceased by a daughter, Darla Bedford in 1977, her husband, Edward Lewis in 1987 and her father, Erwin Morse in 1959. A memorial service was held October 3 at Cavanaugh’s Funeral Home in Media, PA. –Canton Independent Sentinel. Buried E. Canton Cemetery. PETER D. MORSE, aged 67, died at his home in West Leroy, Tuesday morning June 8, 1950. He is survived by his wife Blanche, a daughter Mrs. Frank Wilcox, a son Victor. The body is at the Morse Funeral Home at Canton, where services will be held Friday at 2 p.m. with Rev. Owen Barrett pastor will officiate. Burial in East Canton Cemetery. –Canton Independent Sentinel. On the evening of Thursday, February 6, 2003, Canton resident Ruth (Morse) Wilcox died quietly at Broad Acres Nursing Home in Wellsboro. She was 92 years of age. Born Dec. 23, 1910, in Granville Summit, she was the daughter of the late Burr R. Morse and Minnie (Shedden) Morse. In her youth, while attending the West LeRoy Methodist Church, she met a young man named Wilmer Wilcox. Inclement weather afforded Wilmer the opportunity to break the ice by offering Ruth a ride home in his carriage. When leaving her at the door, he asked to see her again, and thus began their courtship. They were united in marriage on June 23, 1928, and together they raised two daughters and a son. Theirs was a blessed union that would span 74 years until Wilmer's passing in August 2002. Ruth was every inch a farmer, as adept at handling any farm task as she was at keeping house. She continued to assist in the day-by-day operation of the family farm until 1966, and maintained her membership in the Windfall Grange up to the present. After their retirement from full time farming, the Wilcoxes enjoyed traveling to such places as Switzerland, Nova Scotia, and Hawaii. In later years, Ruth served as a care giver to the elderly at the former Crowe Nursing Home in Canton, as well as offering her services in the homes of private individuals. Along with her husband, Ruth served as an officer of the Canton Senior Citizens. Together they volunteered their services with the "Meals on Wheels" program. Ruth was also a volunteer at the Community Clothing and Quilting Center. Along with her husband, she helped found the Bradford County Heritage Association's farm museum in Troy, and was also a member of the Canton Historical Society. She was an avid bowler and enjoyed playing games, especially 500 rummy. Ruth had a close walk with the Lord all her days. She was an active member of the Windfall United Methodist Church, having served as an officer of the United Methodist Women. She also worked diligently at the many tasks to be done around the church. Most of all, she was devoted to her beloved family. Ruth is survived by her daughters, Pauline (and Bill) Swingle, and Sharon (and Lynn) May, all of Canton, son Warren Wilcox of Pine Valley, N.Y., sisters Martha Pepper of Sayre, Zelma (and Vaughn) Jennings of LeRoy, and Marjorie Wright, and a brother, Harry Morse, all of Canton, a special sister-in-law, Myra Whipple of West Burlington, grandchildren Donna (and Gordon) Corbin of Tarentum, Jane (and Larry) Porter of Releigh, N.C., Robert (and Linda) Haflett of Mifflintown, David (and Darlene) Haflett of Munnsville, N.Y., Kathy (and Michael) Macmer of Granville Summit, and Stephen (and Sherry) May of Centerville, Va., 19 great-grandchildren, and five great-great-grandchildren, as well as numerous nieces, nephews and cousins. She was preceded in death by her beloved husband of 74 years, Wilmer, brothers Erwin and Carlyle Morse and great-grandchild Kelly Corbin. The family will receive friends on Sunday, Feb. 9, from noon until 2 p.m. at the Morse and Kleese Funeral Home Inc., 40 N. Center St., Canton. Funeral services will follow at 2 p.m. with pastors Dale Russell and Jasper Smith officiating. Interment will be in East Canton Cemetery. Memorial contributions may be directed to the Windfall United Methodist Church, RR 1, Box 175, Granville Summit, Pa., 16926, or the Bradford County Heritage Association, P.O. Box 265, Troy, Pa., 16947. STANLEY B. MORSE, 78, Canton RD 1, died Thursday, May 16, 1974 at the Troy Community Hospital after an extended illness. Mr. Morse was born May 6, 1898, the son of Harry A. and Martha (Grace) Morse. He was a member of the LeRoy Church of Christ, Disciples, Canton Lodge No. 425 F&AM, Scottish Rite Bodies of Towanda and the Consistory of Williamsport. He was a member of the board of directors of the First National Bank of Canton, a charter member of the Tri-County Funeral Director’s Association, a member of the Funeral Directors Association of Pennsylvania and the National Funeral Directors Association. He owned and operated the Morse Furniture Store and Morse Funeral Home in Canton for 49 years. He was a deacon of the Church of Christ, Disciples and a veteran of World War I. Surviving are his wife, Harriet, a son Dean S. Morse of Canton, one sister, Mrs. Merle (Grace) Wooster of Canton, a brother, Burr Morse of LeRoy, three grandsons, several nieces and nephews. Funeral and committal service s were held Monday at 2:00 p.m. at the Morse Funeral Home, 12 E. Main St., Canton. Officiating were the Rev. Duane Taylor of the Church of Christ, Disciples of Leroy and the Rev. Thomas Logston of the Canton Church of Christ, Disciples. Burial was in the East Canton Cemetery. –Canton Independent Sentinel. VICTOR M. MORSE, 66, of Canton RD 1, Pa., died Wednesday, Feb. 17, 1982, at his home. Mr. Morse was born Nov. 11, 1915 in LeRoy Township, Bradford County, Pa., a son of Peter and Ruth Andrews Morse. He was a farmer and a member and deacon of the LeRoy Baptist Church. He is survived by his wife the former Esther Hall, at home; a son, David A. Morse of Jersey Shore RD 3, Pa.; a daughter, Ruth Taylor of Canton; two step-sons, James A. Mosier of Elmira, N.Y. and Charles Mosier of Canton RD 1; a step-daughter, Esther McIlwain of Wellsburg, N.Y.; 13 grandchildren; seven great-grandchildren; one sister, Mrs. Frank (Bertha) Wilcox, of Canton RD 1; one niece and one nephew. Funeral services will be held Saturday at 11 a.m. at the LeRoy Baptist Church with the Rev. Ray Ackley, his pastor, officiating. Interment will be in the East Canton Cemetery. Friends may call at the Morse and Kleese Funeral Home, Canton, on Friday, evening from 7 to 9 p.m. Memorial donations may be directed to the LeRoy Baptist Church in Mr. Morse’s memory. –Towanda Daily Review. KEITH T. MOSIER, 82, Trout run, PA, died after a lengthy illness, at the Williamsport Hospital and Medical Center, December 29, 1995. Mr. Mosier was born August 13, 1913, in Tunkhannock, PA, son of the late Allison and Emily (Miller) Mosier. He was the husband of the late Laura (Biddle) Mosier who died on October 15, 1995. Mr. Mosier was a member of the Canton Church of Christ (Disciples of Christ), serving as past treasurer; United States Navy veteran of WWII; worked as a clerk at Biddle’s Men and Boys Store in Canton and later was employed by Theo. C. Auman Funeral Home, Inc., Reading, PA; former member of the Canton Rotary Club; Canton F&AM Lodge #415 and Worthy Patron of Eastern Star. Surviving are two daughters and sons-in-law, Constance Ann and William Waugh, Marsh Hill, and Dr. Mary Patricia Mosier and Alberto Pasquate, Houston, TX; two granddaughters, Margery and William Schammel, Baltimore, MD and Julie and Kenneth Fernster, Marsh Hill; brother, Richard Mosier, Brandon, FL; sisters, Daisy Holdren, Laceyville and Kathleen Koerner, Tunkhannock. A memorial service was held January 2 from the Morse and Kleese Funeral Home, Canton, with the Rev. David Morris, pastor of the Canton Church of Christ, and Pastor Phyllis Hunter of the Ralston United Methodist Church officiating. Interment was in the East Canton Cemetery. The family suggests memorials for Mr. Mosier be directed to the Alzheimer Association, Chicago, IL. –Canton Independent Sentinel.